(6% sales tax will be added for Kentucky residents.) Books will be delivered via USPS Priority. Please allow 5 to 7 business days for your delivery. (6% sales tax will be added for Kentucky residents.) Free shipping! Books will be delivered immediately via email! "This book could not have come at a more opportune time. A ray of hope amid chaos..."
"MaryClaire O'Neal is a person of real grace and a superb teacher. 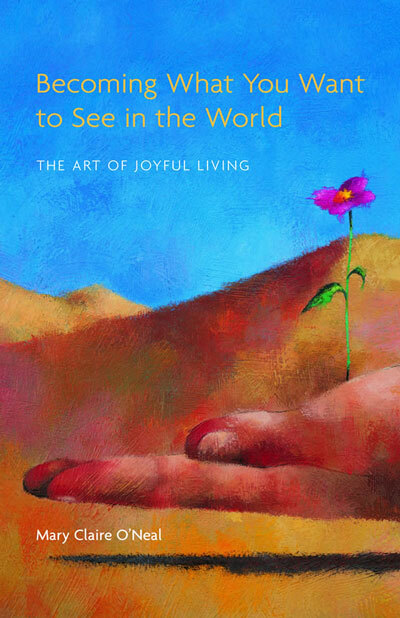 In this book, both of those qualities come through in captivating and inspiring ways that allow us to rethink who we are and what we are seeking in the world. 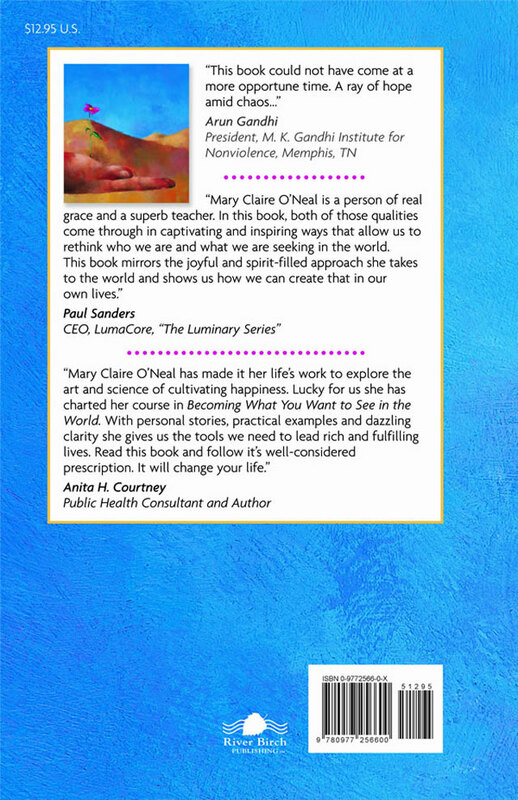 This book mirrors the joyful and spirit-filled approach she takes to the world and shows us how we can create that in our lives." 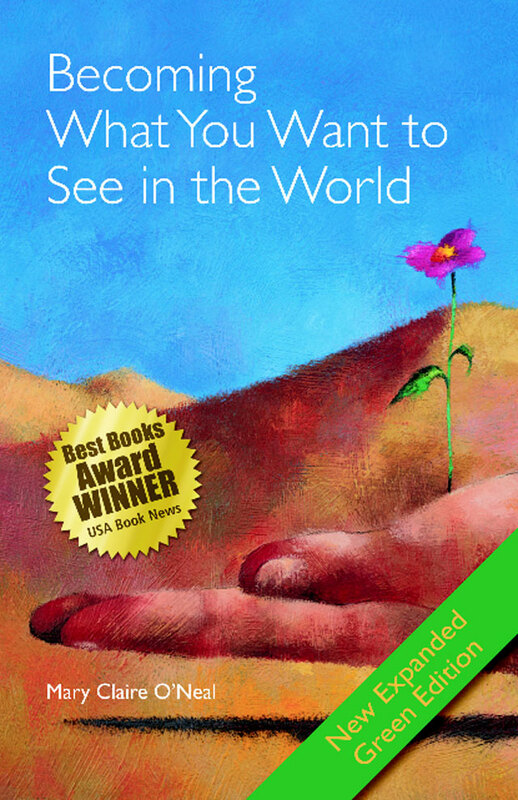 "Becoming What You Want to See in the World is a thoroughly 'reader friendly' compilation of clear, concise principles and action plans that are founded upon effective and compassionate communication. 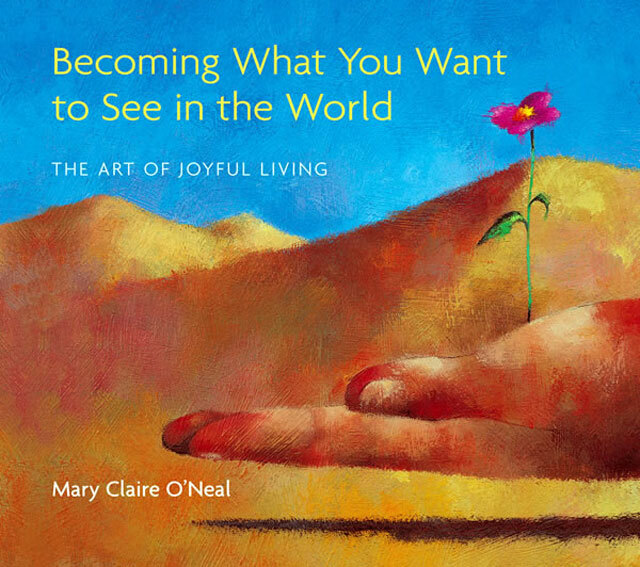 If you only have time and energy for one self-help, self-improvement book at present, you would be well advised to make it Mary Claire O'Neal's Becoming What You Want to See in the World." 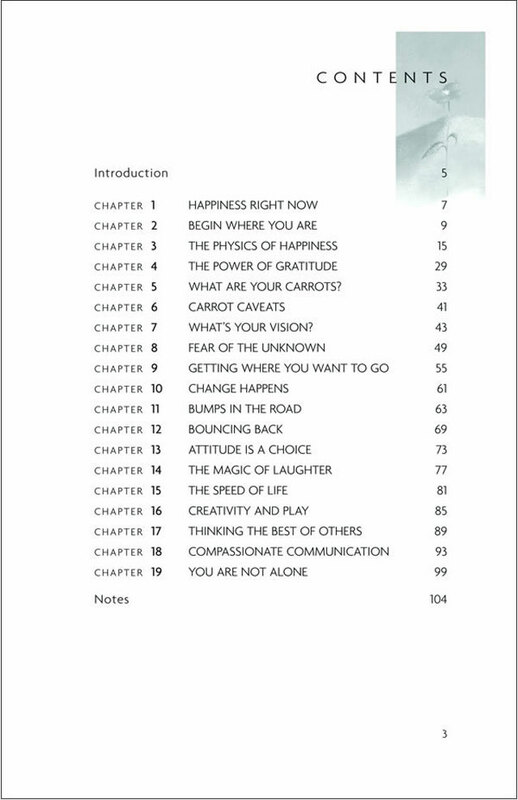 "The text contains practical advice and meaningful examples of how to lead a more fulfilling life from a seasoned professional ... The book centers around tools anyone can use to improve their outlook on life." "If you’re looking for a life coach, or motivating stories and affirmations, O’Neal’s personable manner and conviction in her philosophy will be attractive." 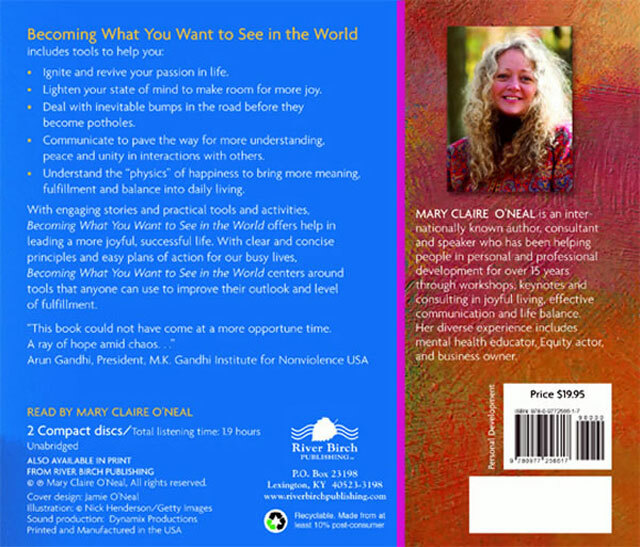 "A superbly recorded, two disc, 1.9 hour audio book production narrated by Mary Claire O'Neal, Becoming What You Want To See In The World examines the 'physics' of happiness and how anyone can invoke and restore passion and joy into the fabric of their lives. Replete with inspiring personal stories, Becoming What You Want To See In The World also provides tools and activities illustrating practical approaches to leading a more fulfilled, balanced, and meaningful life regardless of the listener's personal circumstances or economic restrictions. Especially recommended to the attention of those who are leading busy, time stressed lives, and feel they don't have the ability or opportunity to make changes in their schedules or themselves, Becoming What You Want To See In The World is ideal for learning how to take the time and invest the energy needed to improve the quality of life on a daily basis." (6% de impuesto de venta se añadirá para los residentes de Kentucky) Los libros serán enviados a través de USPS Priority. Favor de dar 5 a 7 días de tiempo para la entrega. "Este libro no pudo haber venido en un momento más oportuno. Es un rayo de esperanza en medio del caos..."
"Llega a ser lo que deseas ver en el mundo es una recopilación que informa al lector de manera absolutamente cordial sobre principios claros y concisos, y planes de acción fundados en base a comunicación efectiva y compasiva. Si usted sólo tiene tiempo en este momento para un libro de autoayuda, entonces le aconsejamos con confianza que éste sea Llega a ser lo que deseas ver en el mundo por Mary Claire O'Neal." "MaryClaire O'Neal es una persona de auténtica gracia y una espléndida maestra. En este libro, ambas cualidades se dejan notar de manera cautivante e inspiradora de modo que nos permiten reflexionar sobre quiénes somos y lo que estamos buscando en el mundo. Este libro refleja el enfoque alegre y espiritual con que ella enfrenta el mundo, y nos enseña cómo podemos crear lo mismo en nuestras propias vidas." Certified Coach, Award-winning author, and speaker. © 2019 Mary Claire O'Neal, All Rights Reserved.